For many of us, whether we are climbers, skiers, boarders, bikers, paddlers or flyers, a large part of our sport is pushing our limits and challenging ourselves - challenging what our bodies and our minds tell us is possible. For some, there are more challenges imposed upon them than others. But those challenges only hold you back if you let them. Telemark Skier Magazine sent crew to Niseko, Japan to find the soul of backcountry skiing there. They sure found it, and a whole lot more. Last for this weekend, but definitely not least, is this edit from Crystal Wright during her 2013/2014 season. Not only does she have awesome footage of some great lines, she also has a touching dedication to fallen AAI Guide, Liz Daley. Thank you Crystal for helping keep Liz's spirit alive! Crystal Wright Ski 2013/14 from Brian Mulvihill on Vimeo. When I first heard about Twitter, I thought it was dumb. Outdoor social media guru, Sara Lingafelter, (also known as rock climber girl, after her extremely popular blog, RockClimberGirl.com) came to visit us in 2009. At that time she introduced us to the art of tweeting. We started slow. Really slow. But we got some tweets out there are started to get a few followers. And in an email to the guides, I even wrote, "we're on twitter now. So if you're interested, check out @AlpineInstitute, but if you don't know what Twitter is, don't worry about it. It's kinda' stupid. But then I discovered that Twitter can be fun and useful. This became especially true when we discovered some of the best "Twitterbugs" out there. @AAI_Shop - Yep, that's our gear shop, chocked full of equipment specialists that work with our guides to understand the strengths and weaknesses of every type of outdoor equipment that we use! @NPCA -- This is the National Parks Conservation Association. They provide a great overview of National Parks issues. Tyler Perry is the highest paid man in Hollywood. See, this is why you guys don't deserve to not get exploded. Nothing in life is free. Unless you can crush people's windpipes with your mind. Then people are strangely generous. So that's how I waste my day. How about you guys? What am I missing that's consistently informative and interesting for the climber/skier...? Last year, Cedar Wright and Alex Honnold shared with us an adventure with possibly as many laughs and it did climbs during their biking and climbing epic, "Sufferfest." Well, they are back at it again - this time with desert towers. "Sufferfest 2" looks to be just as awesome! Sufferfest 2: Desert Alpine, AKA 34 Pieces of Choss and 5 Horrendous Life Experiences, Starring Alex Honnold and Cedar Wright - Trailer from Cedar Wright on Vimeo. Last week we showed DPS Skis' first foray into cinema, and it was no disappointment. This week brings the second episode in their Shadow Campaign. "Whitewash" features Zach Giffon, Olaf Larsson, Piers Solomon, and some deep, deep Mt. Baker backcountry. Keep up the good work DPS! The Shadow Campaign // Whitewash from DPS SKIS on Vimeo. While most of the Northeast is getting pummeled by the massive lake-effect snow storm, I am sure lots of folks are going to be out this weekend enjoying some amazing powder. But I found this video of a couple enjoying the storm in a different way and had to share it! WNY - Blizzard Surfing from Kevin Cullen on Vimeo. Weekend warriors. Dawn patrol. Full-moon tours. All examples of us trying to squeeze the things that we love to do in to the mix of our busy, every-day lives. This short from a series by Vaude highlights some "5 to 9 Adventures" for those who try to get the goods before and after the normal work day. Last month, The North Face announced a partnership with the Department of the Interior's 21st Century Conservation Service Corps (21CSC) program to help get young adults and veterans working on conservation and restoration projects that help protect our land, water and wildlife. The video below is part of the unveiling of the project and here is the link to more information about it. Ever since pro snowboarder (and Bellingham local, I might add) Lucas Debari saw a small, pixelated photo of a captivating, yet unnamed, peak in Greenland, he was determined to plan an amazing expedition there. For this last video of the weekend, grab a cup of something warm (or a frosty, cold one if you prefer) sit back for the next half hour and enjoy this snowboard awesomeness from Nitro. The Bad Seeds! FREE snowboard video by Nitro Snowboards from Nitro Snowboards on Vimeo. The Access Fund has just launched an ambitious new project. They are trying to get the word out about "The Pact," a series of guidelines that all climbers should universally follow in order to preserve our access to climbing areas. 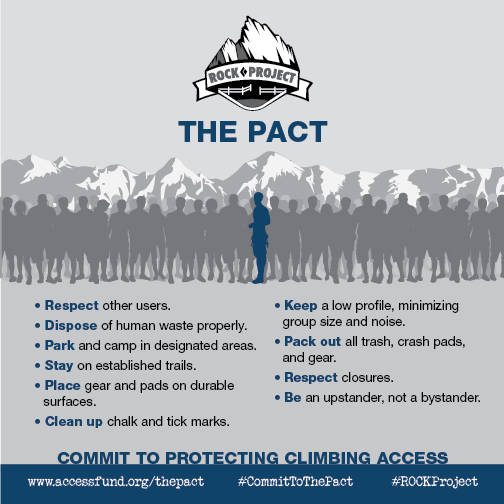 According to the Access Fund, "The Pact is a promise—a covenant with our fellow climbers to practice a set of 10 responsible outdoor behaviors that protect climbing access." This is something that we at the American Alpine Institute support completely. Please sign The Pact and support our continued climbing access. I just can't say this enough - I want to go to Japan! I am just blown away at every video I see from there! This first video for the weekend is no exception. This year, the Big Mountain World Heli Challenge moved to Mt. Cook in New Zealand, and served up some pretty amazing lines. This not your typical GS or halfpipe style competition. This is taking it to another level. For most people, the words "desert" and "ice" don't usually go together - unless your sentence is something like, "This desert is so hot! I wish I had some ice!" But over the last couple seasons those two words have come together to form something amazing in Zion National Park. There has been an explosion of development in ice climbing there, and the lines are pretty incredible! So there have been quite a few funny marketing pranks in the last couple years. Most of them have been to promote scary movies, like this one to promote the Carrie remake, and this one to promote a Chucky movie. Essentially the customers come in. The floor begins to roll away so that they're forced onto the climbing wall. A large, presumably inflatable, pad appears deep down below them. Then a product comes out of the ceiling which they can jump for. I can't imagine that a North Face shop in the US could get away with something like this without getting sued. But it sure would be awesome! I hope everyone had a great Halloween! In case you didn't get enough scares last night, here's a few more frights for this weekend. For the first video, we have a nice compilation of palm sweating, pebbly, run-out Gritstone climbing. Once you've slowed your pulse down a little and caught your breath, how about you check out this next one. John Freeman is a climbing guide and rope access supervisor, and according to Will Gadd, one of the safest and most knowledgable climbers around. But when the pillar he is climbing shatters near the top, it makes for one scary fall. It must be something about Brits, but they sure know how to push the "scary meter" to the limit. Hazel Findley did just that, with her ascent of "Once Upon A Time in the West," an E9 (which translates to both hard and scary) on the seaside cliffs of Devon, UK. And last, but not least, one more ice climbing scare. In this one, the climber is topping out on a thin, wet pitch and can't get any good sticks. It's warm and wet, and the ice is quickly breaking off around him. Luckily, there are some other climbers above him setting up a rappel who are able to help him out with a top rope just in the nick of time.